This exclusive commissioned piece is Emigdio’s final still-life. It took seventeen layers of oil paints to create the look and feel of the hammered copper and brass in this Classic Italian Coffee Machine. 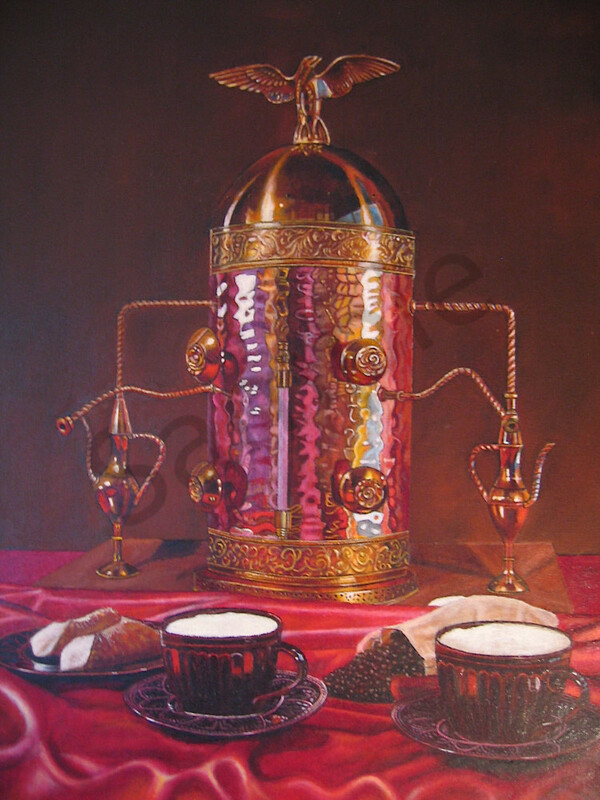 The composition and colors gives viewer an invitation to smell the coffee aroma and taste the cannoli. Mangia. This Limited Edition Giclee is 18 x 24, its original size. There are only 120 high quality canvas prints available including a Certificate of Authenticity. This exclusive commissioned piece is Emigdio’s final still-life. It took seventeen layers of oil paints to create the look and feel of the hammered copper and brass in this Classic Italian Coffee Machine. The composition and colors gives viewer an invitation to smell the coffee aroma and taste the cannoli. Mangia. This Limited Edition Giclee is 18 x 24, its original size. There are only 120 high quality canvas prints available including a Certificate of Authenticity. The price is exclusive of any tax, shipping, or frame.